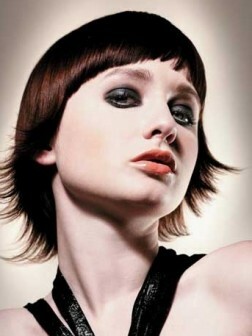 Shoulder length and medium short haircuts are perfect for thin and fine hair. The length provides you with numerous styling options and at the same sets you free from long hours spent by the mirror. Moreover medium hairstyle is the most popular one in hairstyles trends 2013 so you will never regret that you have chopped off hair. We have chosen hair length, now it is time to decorate it. Graduated layering is just perfect for thin hair as it will visually oomph up the volume of hair and make it look thicker. Layers should be placed on the crown area so that when styling short layers will provide you with desired volume. Medium layered hairstyle can also be combined with stylish side bang that will place the accent on your beautiful facial features.